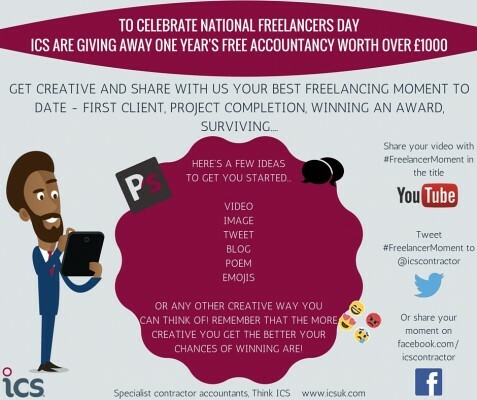 FREELANCERS and contractors have the chance to enter a competition and win free accountancy services from ICS for an entire year. We’ve launched the competition to mark the seventh annual National Freelancers Day and the winner will walk away with a prize worth over £1,000. We are looking for the best creative entry that illustrates the entrant’s greatest freelancing moment to date. For example, it might be that first client win, the biggest project completion or winning an award. National Freelancers Day was launched by IPSE (The Association of Independent Professionals and the Self-Employed) to showcase and reward the work that freelancers and the self-employed deliver every year. If you are a freelancer or contractor and you would like to take part in the competition, then please either email your entries to marketing@icsuk.com, via Twitter (@icscontractor), Facebook or YouTube, using the hashtag #FreelancerMoment before the deadline of Friday 27th November. For terms and conditions, please visit the ICS website. ICS, based in Lancaster in Lancashire, provides accountancy and administration services to thousands of contractors across the UK through its Limited Company and umbrella employment solution.